At the moment we are waiting in limbo for a couple of big stories to break. We don’t know yet if there will be a government shutdown. (If there is a shutdown, will drone attacks and NSA surveillance be halted? Unfortunately no.) One way to avert a government shutdown would be to tell Trump that McDonald’s will shut down if the government does. The DNC Rules and Bylaws Committee meets tomorrow to vote on the recommendations of the Unity Reform Commission–which are very limited and do not do enough. If the DNC rejects these recommendations the Democratic Party will be demonstrating a contempt for democracy which would make Thomas Jefferson, along with FDR, roll over in their graves. It could also be said that they already demonstrated this in 2016. 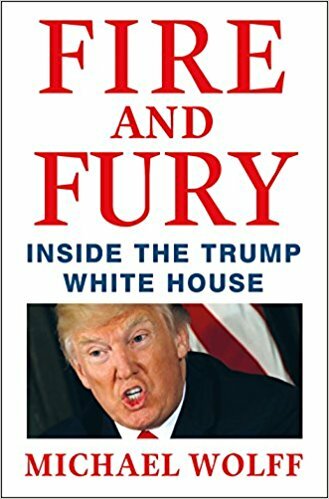 While waiting for the answers, I decided to go back and quote interesting passages from Michael Wolff’s recent book, Fire and Fury: Inside the Trump White House. I previously noted some selections from the book here. There were further quotations regarding Wolff’s view that the Russia scandal is about money laundering, and not about collusion to affect the election 2016 election results, here. The question of Trump’s state of mind was reviewed here. Here are some additional items of interest. If the Trump White House was as unsettling as any in American history, the president’s views of foreign policy and the world at large were among its most random, uninformed, and seemingly capricious aspects. His advisers didn’t know whether he was an isolationist or a militarist, or whether he could distinguish between the two. He was enamored with generals and determined that people with military command experience take the lead in foreign policy, but he hated to be told what to do. He was against nation building, but he believed there were few situations that he couldn’t personally make better. He had little to no experience in foreign policy, but he had no respect for the experts, either. All things considered, he probably preferred the notion of more people having health insurance than fewer people having it. He was even, when push came to shove, rather more for Obamacare than for repealing Obamacare. As well, he had made a set of rash Obama-like promises, going so far as to say that under a forthcoming Trumpcare plan (he had to be strongly discouraged from using this kind of rebranding — political wise men told him that this was one instance where he might not want to claim ownership with his name), no one would lose their health insurance, and that preexisting conditions would continue to be covered. In fact, he probably favored government-funded health care more than any other Republican. “Why can’t Medicare simply cover everybody?” he had impatiently wondered aloud during one discussion with aides, all of whom were careful not to react to this heresy. Of course this has no practical value, with Trump having no understanding of the details of health care legislation and no interest in really doing the work to promote a plan, allowing Congressional Republicans to push their agenda. Posted in Barack Obama, Bernie Sanders, Democrats, Donald Trump, Foreign Policy & National Security, Health Care, Hillary Clinton, Scandals. Tags: Barack Obama, Bernie Sanders, Democrats, Donald Trump, Health Care Reform, Hillary Clinton, Medicare, Russia, Scandals. RSS feed for comments on this post.. TrackBack URL.